Patrick Comerford: Why are there few book buyers in the best-known bookshop in Porto? I joined the queues in Porto early yesterday to visit Livraria Lello, said by many to be one of the most beautiful bookshops in the world. This is one of the oldest bookshops in Portugal and it is often rated as one of the best bookshops in the world in lists from the Lonely Planet and CNN to Time magazine and the Guardian. The bookshop in the centre of Porto is visited by thousands of people every day, attracted more by its reputation than its contents. The shop was visited regularly by JK Rowling when she was living in Porto and teaching English, and it is said to have been the inspiration for many of the scenes in her Harry Potter series. The shop first opened its doors in 1906, and ever since Livraria Lello has dazzled readers and the curious. The building was refurbished in 2017, when the façade was restored in its original colours, along with its stained glass and its unique twisting, spiral stairs. Livraria Lello’s shelves are stacked high with vast collections that include first editions, books signed by authors, rare books and recent editions of luxury books. The origins of this bookshop date back to 1881, when the brothers José and António Lello opened their first shop in Porto. They soon moved their business to Rua do Almada, and in 1894 José Lello bought Chardron Bookshop and its extensive collection and stock, built up Ernesto Chardron from France, who had published the first editions of celebrated works, including books by Eça de Queirós and Camilo Castelo Branco. 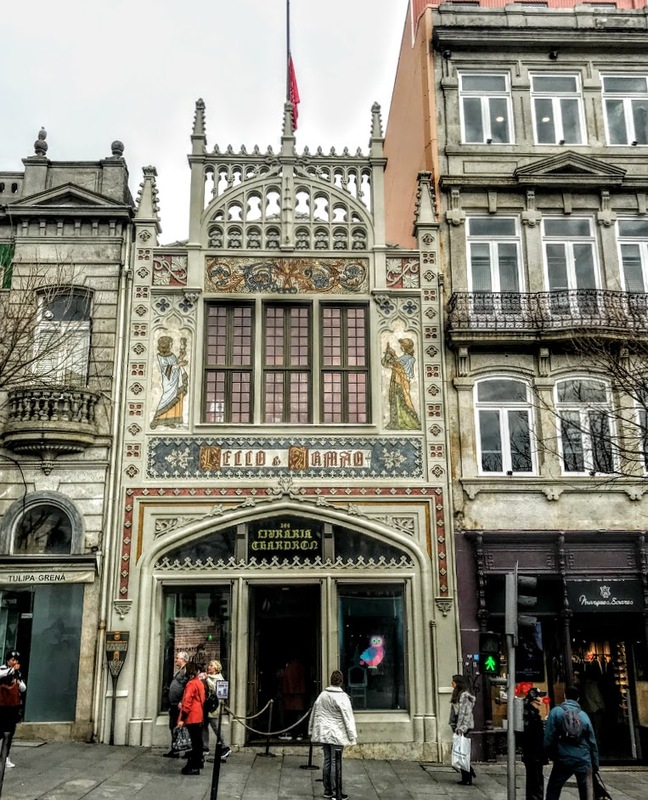 The Lello brothers commissioned the engineer Francisco Xavier Esteves (1864-1944) to build a new bookshop on Rua das Carmelitas, and so the renamed Livraria Lello began a new life. The new bookshop opened on Rua das Carmelitas on 13 January 1906 with the public endorsement of key figures in Portuguese cultural, political, commercial and social life, including the writers Guerra Junqueiro and Júlio Brandão, the director of O Comércio, Bento Carqueja, and Aurélio Paz dos Reis, the pioneer of cinema in Portugal. The bookstore is flanked by shops and us close to the Porto University Faculty of Sciences building, the tower and Clérigos Church. It faces south towards the Rua das Carmelitas and the Praça de Lisboa. The colourful neo-gothic façade is decorated with paintings by Professor José Bielman symbolising Art, holding a sculpture, and Science, holding a symbol of anthropology, and has a mixture of architectural style, with neo-Gothic and Art Nouveau elements. Decorative elements complete the façade, with alternating geometric shapes that circuit and the firm’s name, ‘Lello & Brother’, over the bow, all painted in vivid colours that highlight the white paint on the facade. Inside, throughout the shop, there are the busts of some of the most important Portuguese writers, including as Eça de Queirós, Camilo Castelo Branco or Teófilo Braga. The rectangular plan covers two storeys, representing a simple mass, covered by a tiled roof. Inside, there are Art Deco elements throughout the building. But the interior is best known for the forked crimson staircase and the majestic ceiling. This ceiling looks deceptively like carved wood but is in fact painted plaster, a technique also used in decorating the stairs. The architectural details on the first floor include Art Déco details on the walls and the columns that rise from the lower floor. The stained glass above is a glass structure measuring 8 meters by 3.5 meters. The words Decus in Labore (‘Dignity in Work’), a golden rule of the house that applies to everyone who enters. 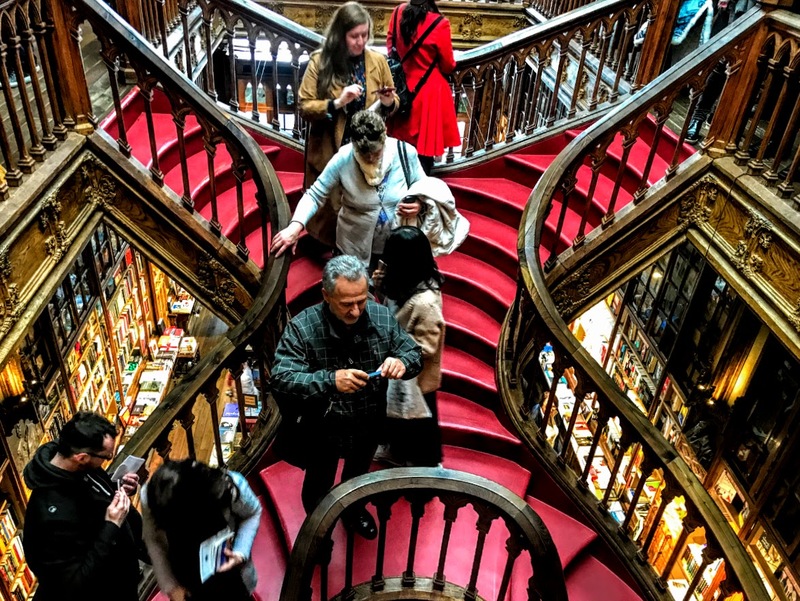 The last few decades have seen a remarkable growth in tourism in Porto and the number of visitors to Livraria Lello. The bookshop had to face the challenge in 2016-2017 of refurbishing the building to accommodate the number of visitors while protecting its primary function as a bookshop yet renovating the interior and restoring the façade and stained glass. 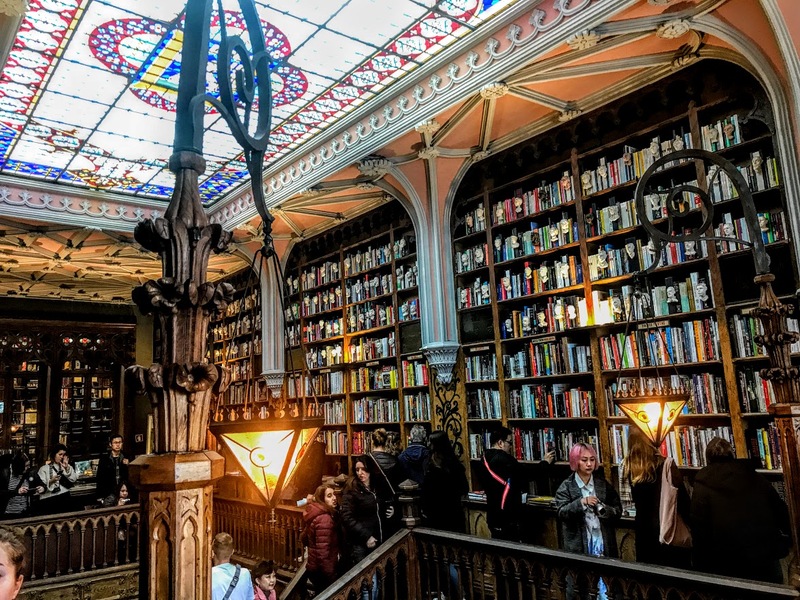 The bookshop has adapted to a new business model, and today admittance comes with the purchase of €5 tickets – the cost of a ticket can be deducted from the price of a book if a visitor is a genuine book-buying customer. Despite the house rules that discourage ‘selfies’ and try to ban ‘selfie-sticks,’ the forked crimson stairs quickly becomes blocked with tourists who are more interested in their own appearances than the books on the shelves. 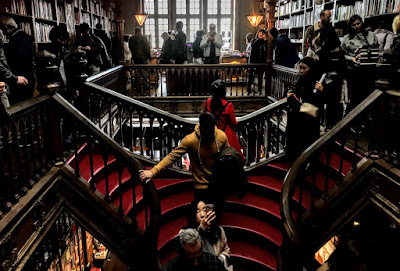 But, while Livraria Lello is now a major tourist attraction, it remains true its original purpose: a bookshop for book lovers. And, yes, we spent our two €5 vouchers.